The Green Acres Middle School program challenges students in ways appropriate to their increasing cognitive sophistication, their growing emphasis on friendships, their soaring interest in questions of morality, and even their rapid physical development. 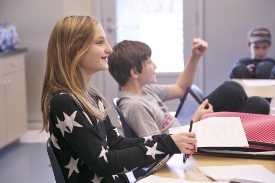 High academic expectations form the core of the Middle School program. Students grapple with broader responsibilities, greater self-reliance, and increased independence. They are engaged in the process of becoming self-directed learners with a passion for knowledge, a growing awareness of our diverse and complex world, and a sense of responsibility for the larger community. Students participate in more demanding outdoor education opportunities, join interscholastic athletic teams, and design their own community service projects. They also take part in more varied programs, such as film photography, the annual Grade 7 and Grade 8 musical, and the Green Acres Olympics. Our Grade 8 curriculum includes an emphasis on Community Service. This program is based on the principle that an ethical life includes service to others. Students are encouraged to broaden their perspectives and improve themselves and the world around them in increasingly sophisticated ways. By the time our students graduate, they have encountered rich and challenging experiences, many of their own making. Green Acres students develop a strong sense of who they are, both as learners and as members of our society.